Judy Blume will be speaking at the University of Hartford on June 21st as a fundraiser for The Mark Twain House & Museum. I’ll be interviewing her onstage and taking tons of audience questions. In preparation, I will be reading her complete works and blogging about the experience. Get your tickets here. When I was about twelve, a friend and I grew apart in a major way. Even though we'd been close since kindergarten, the stresses of middle school and the fact that we were both sort of lame grew between us. We began to fight a lot, mostly because we wanted to be friends with cooler girls. Of course, it was completely possible that we could have undergone this journey to coolness together, but it seemed somehow easier to tear each other down in order to avoid last place in the popularity race. It was a painful and sad time, and very confusing. I felt like no one else could see the world from my point of view. Around this time, this girl shared Just as Long As We're Together with me. 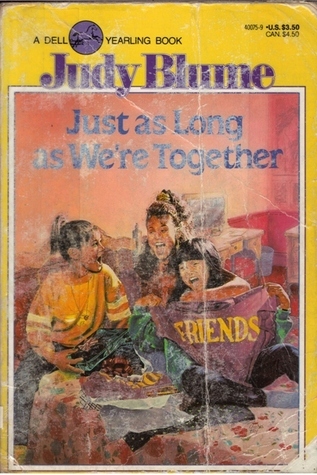 The story of two friends who must navigate new waters in their relationship when a new friend comes to town, this book, of all of Judy Blume's, changed my mindset the most. It's a really simple story about a group of three girls-- one funny, one stressed, and one new and sort of weird-- sensitive to the shifting nature of any trio. I wonder what Allison will say when I tell her Rachel and I are speaking again, that maybe we are even friends. Probably she'll be glad. Female friendships (perhaps any friendships) are like tectonic plates. There are so many little movements imperceptible to the naked eye, and then all of a sudden you've got a chasm in the earth or a stunning mountain. Not much happens in this book-- Steph and Allison have classes together and Rachel has a different schedule; different seating arrangements on the bus are attempted; sleepovers are arranged. And then all of a sudden characters aren't speaking. And then they are. This was my experience, too. The weight of a thousand little comments added up to something. I wish they hadn't. I wish they'd vanished into thin air the moment they were spoken. I wish I had seen better how my friend's anxieties were related to her own becoming; I wish I had eased them. But among the passed notes and locked diaries, there were some books that came from far away and held out one small plea: here's how it feels. Stephanie's story felt like mine. And soon after, I read the sequel-- and that felt like my friend. We are still close friends to this day.